Welcome to another Where We Live. Today we’ll be exploring the communities of River East, on the other side of the river that DC sometimes forgets about: Anacostia, Congress Heights, and Barry Farm. These neighborhoods have rich histories, and are currently seeing massive new redevelopment projects. Read on for the places to go and things to see in River East, a part of DC that you probably haven’t visited yet. History: Anacostia was named after the Anacostan Native Americans, and when John Smith sailed up the Anacostia River he wrote that he was well received by these people. Anacostia was originally a suburb of Washington and was incorporated into the city in 1854. Anacostia was originally a working-class neighborhood, home to many people who worked nearby in the Navy Yard. Despite covenants restricting the sale of land to African Americans and Irish Americans, by 1880 more than 15 percent of residents were African American. Throughout the twentieth century the demographics shifted, with many working class white families fleeing the city, and Anacostia is now home to a high concentration (this National Park Service page says 99%, the 2000 Census says 96%) of African Americans. Check out the University of Virginia’s Crossing the River online project that documents race, geography, and the role of feds in Anacostia. Just a few blocks to the southeast of Anacostia, Congress Heights was developed in the 1920s as the end of a streetcar line. There wasn’t much in the area aside from St. Elizabeths Hospital and Camp Simms, home of the DC National Guard. The area grew to be a suburban-style residential neighborhood with a strong commercial component. Today, both St. Elizabeths Hospital and Camp Simms are the sites of major redevelopment efforts. 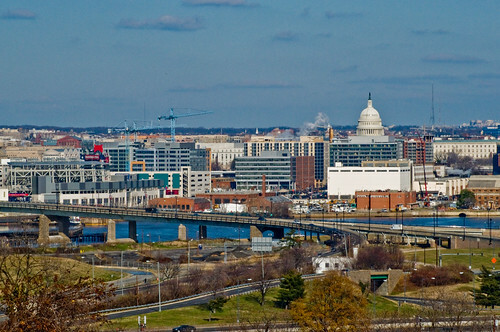 Separated by a river from the rest of DC, the neighborhoods east of the river have typically failed to attract the type of development in other parts of DC. For a long time, River East languished, and did not see as much Metro-related redevelopment as other parts of the city, like Shaw and Brookland. But these neighborhoods are finally coming back: with more affordable housing, some beautiful historic housing options, and great access into the city, residents are finally seeing the value in the neighborhoods east of the river. 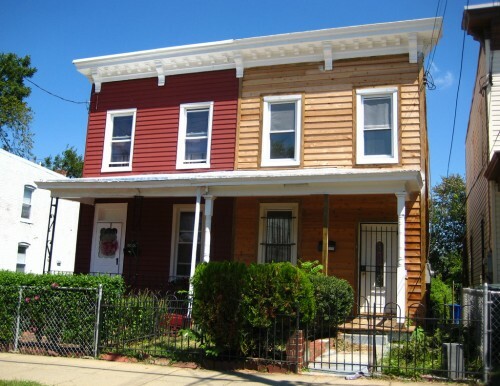 Neighborhood Character: There’s lots of strip commercial development along Martin Luther King Jr Ave SE, and a historic district in Anacostia, but much of the area is residential in nature. Much of the residential development in River East consists of a variety of historic rowhouses, many with big front porches. Parts of the area are more suburban in nature, with “rolling hills, parks and forests. Congress Heights has a lot of really beautiful green spaces. There is a lot of wildlife in our community. It is quite common to see deer walking in the neighborhood, bald eagles flying above and raccoons and foxes scurrying around after dark,” according to Nikki, a resident of two years and author of Congress Heights on the Rise. There are big changes coming to this part of the city. The Department of Homeland Security recently broke ground at St. Elizabeths for a $3.4 billion new facility, which will bring thousands of new employees to the area on a daily basis. And there are a number of residential and mixed-use developments happening throughout the area that will really transform the area into more of a walkable neighborhood in the future. David, an Anacostia resident of two years and author of And Now, Anacostia, says, “I think that Anacostia’s potential has me most excited of anything existing in the neighborhood right now. In the two years that I’ve been here countless houses have been fixed up, a new office building has been built and filled with workers, a new photography lab / gallery has opened, and it has started getting the attention of a wider audience.” It looks like the best is yet to come for River East. Transportation: Anacostia and Congress Heights both have centrally-located Metro stations on the green line. In the future, this are will be served by a streetcar (it was originally supposed to be operational this year, but delays have pushed it until at least 2012). Walking and biking access is improving, particularly with the growth of the Anacostia Riverwalk Trail. The Anacostia Riverwalk Trail is a 20-mile network of trails that connect along and across the Anacostia River, reconnecting this community with the rest of DC. The whole network is not yet complete, but it is growing every day, and there are some great walking and bike trails that reach into River East communities and provide great riverfront access. Bet you didn’t know there’s a Smithsonian Museum in Anacostia! 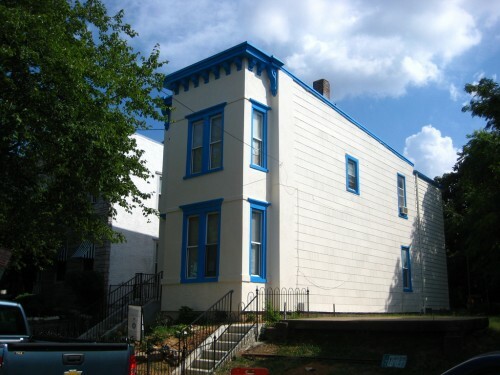 The Anacostia Community Museum was founded in 1967 and focuses on African American history and culture, with particular ties to the DC region. 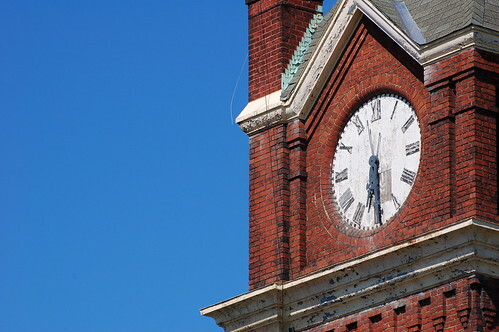 The Ward 8 Farmer’s Market is in its eleventh year and offers fresh produce every Saturday through November from 9 AM to 2 PM in the Old Congress Heights School. The Shops at Park Village represents a major retail investment in this area, which has traditionally lacked many retail options. There’s a Giant grocery store, and an IHOP, which is the first sit-down restaurant in Ward 8. David says to keep an eye out for Big Chair Coffee, opening any week now. It will be the neighborhood’s first coffee shop. First, familiarize yourself with the area through the Kojo Nnamdi hour from last month. Get to know the bloggers behind the blogs! And Now, Anacostia is a great site focusing on Anacostia development, architecture, and community events. It’s a great site to keep up-to-date with all the changes happening in the neighborhood, from the streetcar to St. E’s to Verizon FIOS. Check out Congress Heights on the Rise for information on the Advisory Neighborhood Commission (ANC) in the neighborhood, with great resources on redevelopment and community events. Barry Farm (Re)Mixed focuses on the neighborhood in between Congress Heights and Anacostia. It’s a great resource for historic photos of the area, urban design critiques, and the final say on what the neighborhood’s name is. Why We Love It: This is a part of our city that has historically been ignored, and now is its time to shine. With major investments coming to the area, the number of sit-down restaurants in the area will grow beyond one, the housing options in the area will increase, and the area will recover its identity as a walkable, mixed-use area. There’s so much to offer here that you can’t get in the city, like access to nature, affordable housing, and beautiful historic properties. Thank you so much for including me in the article. I LOVE IT! It’s such a great representation of the wonderful place where we live. It’s not perfect but it is getting better every day and that is what makes it so special. It never ceases to amaze me how surprised someone is when they finally make the trip over here and see all that River East has to offer. It really is like this undiscovered affordable secret. Great job on the article! Linking to it now. I liked the way you touched on the history behind the neighborhoods, Shannon, great job as always. But I really wish there were some voices from residents who’ve lived there longer than two years. And “artists get there first” – oh gosh. I don’t quite know how to comment on his quote. I mean, the saying exists because artists move into traditionally impoverished or troubled areas because they are cheap, then they make them “funky,” leading to the neighborhoods gentrifying, becoming trendy and expensive, and eventually displacing the long-term residents. Jenn– I wish I could have talked to more long-term residents too, but I don’t personally know anyone there and the blogs in the area are mostly run by newer residents. As for the “artists get there first” comment, I think we have to put into perspective that this neighborhood has so few amenities now, that any potential for change is seen as good. Both of the residents I spoke to were excited about finally having a grocery store, or a sit-down restaurant, or a coffee shop– things that we take for granted in our neighborhoods. So stepping aside from the gentrification issue, I can completely understand the feeling of wanting more change and development in the neighborhood, just so it starts to feel like a neighborhood. @ Shannon. You hit the nail on the head PERFECTLY. Thank you. Forget gentrification River East – Ward 8 specifically has been overlooked for so long on a development standpoint that we are just recently getting the very basic services and options that other part of the city enjoy. Imagine – ONE sit down resident for an entire Ward of people and that one restaurant is barely a year old. If I want to meet my friends for dinner and drinks (which I do often) I have to go over the bridge. If I want to go see a movie I have to go over the bridge. If I want to buy a book I have to go over the bridge. If I want to buy my dog his food I have to go over the bridge or into Maryland. It’s frustrating and it’s unfair and both new residents such as myself and old residents are all asking (and in some cases demanding) the same things that other parts of the city take for granted. BTW – there is a really great blog run by a life long Southeast resident. Southeast Socialite, http://www.southeastsocialite.blogspot.com and she is one of the biggest advocates for development, progress and accountability in River East. @ Jenn. I appreciate your comment and I don’t know where you live but one thing you learn very quickly once you move to River East is that your perception of things change. Especailly assumption that you may have in theory which seem totally different when you actaully live in the community in which your theories are based. As a resident of Ward 8 I am tired of Ward 8 being the backyard or the spare closet of the District of Columbia. Why does Ward 8 have to sacrafice progress and economic development for the rest of the city? Who said that is was okay to lump all poor (and mostly black people) together? Just because it has been the case for far too long doesn’t make it right and there are many, many residents who are tired of this and want to see it change. What we want (and thank goodness is happening) is more diversity. Diversity in terms of race, socioeconomic standing, jobs, dining, shopping, etc. Ward 8 is a community of residents with hopes and dreams -not a social experiment. Thanks Shannon and Nikki, I appreciate the responses to my comment. Does anyone know the status of the Tiger Woods Learning Center that is planned for DC? There were reports that Tiger’s folks were trying to decide on a location, either Fort Dupont or River East area. They were supposed to announce something in the weeks after the tournament in July, but I haven’t heard anything. Completely agree. I wasn’t trying to say that the artists / gallery owners are the first people to ever care – but rather Among the first to make a serious effort on the commercial corridors here. I try to stay away from the idea that I’m a pioneer over here and that because I’m new or a different race that somehow I’m the one bringing the change. But, sometimes there does need to be a jolt of new for a “better for all” neighborhood to emerge.